GraceLinBlog: What is the Moon Festival? 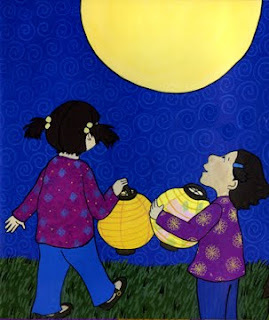 Thanking the Moon is a book that celebrates the Mid-Autumn Moon Festival. While not as well known in the United States as the Lunar New Year (Chinese New Year), the Moon Festival is an very important holiday in many Asian countries. The Moon Festival is rather like an Asian Thanksgiving. To help understand the holiday, today's post is a little Q & A about the Moon Festival. I hope this helps you plan a Moon Festival celebration of your own! Q: When is the Moon Festival celebrated? A: Just like Lunar New Year, the actual date is different every year. It is celebrated the 15th day of the 8th month in the Lunar calendar, which is late Sept. or early Oct. by our calendar. The moon is supposed to be the roundest and most full at this time. This year, the Moon Festival is on September 22nd. Q: Why is the Moon Festival celebrated? A: The Moon Festival probably began as a harvest festival, to celebrate and show gratitude for a successful harvest--similar to Thanksgiving. However, as time went on, many myths and symbols became intertwined with that. Most myths involve the Moon Goddess, Chang-O. According to one version of the legend (there are many), Chang-O was the wife of a Houyi, a man who performed heroic acts. After an act of great heroism (shooting down extra suns that were scorching the earth) he was given pills of immortality. Unfortunately, after his heroism, he became arrogant, selfish and unkind. Chang-O could not bear to think of him being immortal and took the pills herself. She flew up into the moon and became the Moon Goddess. 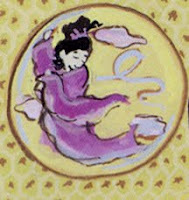 On the night of the Moon Festival, people pay homage to her and send her a secret wish in hopes that she will grant it. Q: How do you celebrate the Moon Festival? A: Like Thanksgiving, the Moon Festival is the time when families gather together. Usually, families gather for a night time picnic, light lanterns, and admire the moon--sometimes singing songs or reciting poetry. The picnic consists of many foods, most of them are round, like pomelos or eggs, to emulate the moon's shape. Even the tea is served in round cups! 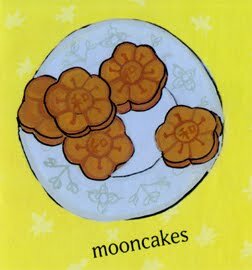 However, the food that is always eaten at the Moon Festival (like turkey at Thanksgiving) is the mooncake. Traditional mooncakes are round, baked pastries with a dense, rich filling inside them and intricate molded designs on top. The filling is usually a sweet bean or lotus seed paste with a whole salted egg yolk (signifying the full moon) in the center. The molded designs are usually Chinese characters such as harmony (which is what the round moon has come to symbolize) or Chang-O, rabbits or decorative flowers. A: More mythology! In most Chang-O myths, her companion on the moon is the Jade Rabbit, who is making more pills of immortality. One version of the Moon Goddess myth claims that Chang-O never gives up hope that her husband will reform and if/when he does, she wishes to have pills ready for him so he can join her on the moon. 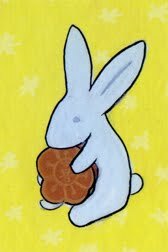 In Chinese culture, rabbits are synonymous with the moon. Q: Why are the mooncakes at my bakery square? A: Traditionally, mooncakes are round to emulate the moon's shape. However, in contemporary times, the mooncakes has evolved. Mooncakes have become popular gifts to give and bakeries have capitalized by making a variety of mooncakes-- from different shapes to different fillings. Nowadays, it isn't unusual to see a mooncake in the shape of a rabbit or even a popular cartoon character. Modern mooncakes also come in a great variety of flavors. As well as the traditional bean paste filling, mooncakes can now be filled with taro, pineapple, chocolate or even ice cream! Now there's a mooncake for even the most timid of eaters. Choose some for your own family for this year's moon festival!